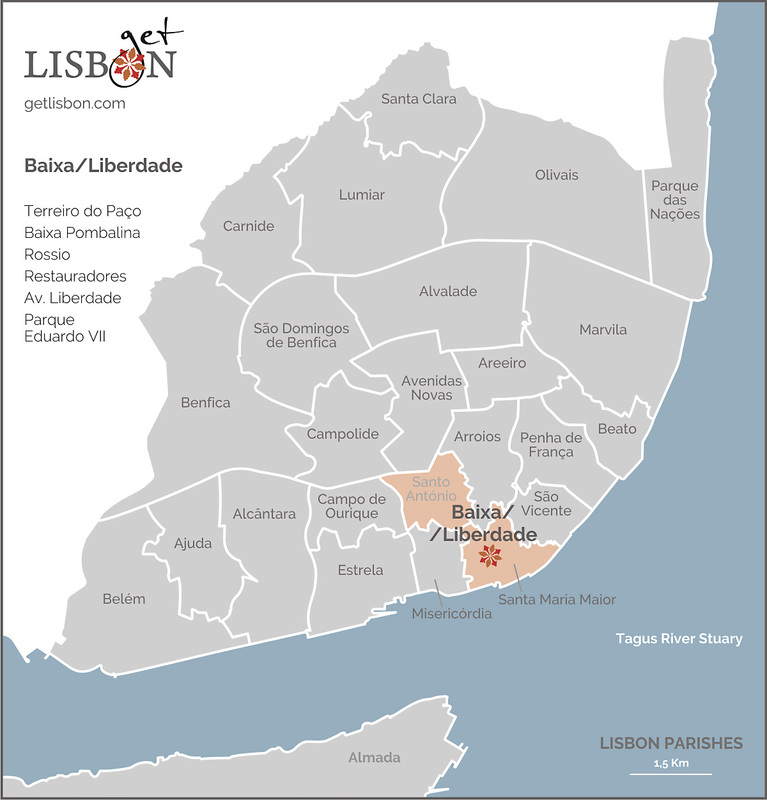 The Baixa/Liberdade route that getLISBON traced, starts at Praça do Comércio and ends at Parque Eduardo VII. The Praça do Comércio or, as it is still called by the lisboetas (people of Lisbon), Terreiro do Paço is where the Royal Palace was situated before the earthquake of 1755. Here was the neuralgic centre of the city, where intricate streets were occupied by craftsmen and shops where products from all over the world were traded. However, this horrible tragedy destroyed the downtown area, several churches, a Jewish quarter and one of the largest hospitals at the time. Right after the earthquake, a team of architects was formed, led by the firm hand of the minister of King José I, Marquês de Pombal. In no time, this team planned and started the reconstruction of the city, based on a modern and ‘projected to the future’ vision. The new constructions present anti-seismic characteristics and the wide streets are developed orthogonally between the two large squares that already previously existed, Terreiro do Paço and Rossio. Due to the importance of Marquês de Pombal’s active role in this project, this part of the city became designated as Pombaline Downtown. 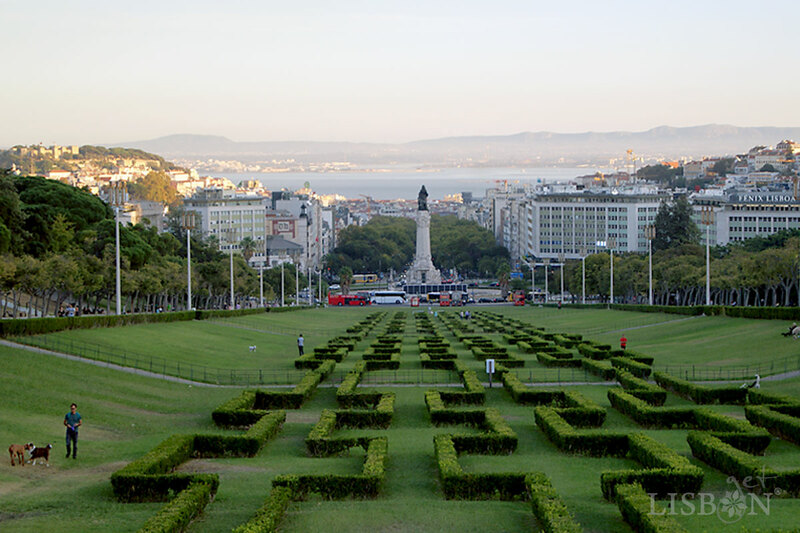 In the 19th century, the city ended in the Public Promenade, a fenced garden with a reasonable dimension, located in the extension of Praça dos Restauradores. This garden, a meeting place in the late afternoon, was where the bourgeoisie strolled to see and be seen. Owing to the need for expansion, in 1879 the Public Promenade was opened to give rise to a big Avenue, the avenue, inspired by the new great boulevards of Paris. Soon, buildings of eclectic and revivalist taste, designed for a high social class, emerged. Despite some negligence in the 1960s and 1970s that led to the destruction of several buildings, today the Avenida da Liberdade still preserves some of the valuable exemplars of the city. It is also undoubtedly, one of the most beautiful arteries of Lisbon. Hedged with leafy trees, it also counts with the lakes and statues of the old Public Promenade, in the first section. The entire avenue is punctuated by sculptures honouring important figures and its sidewalks has a calçada portuguesa (traditional Portuguese limestone pavement) of particular interest. Today, this is where the most luxurious international brands are concentrated. The Avenida da Liberdade culminates in the Praça de Marquês de Pombal and the vast Parque Eduardo VII. From the top of this green area, you can enjoy one of the most emblematic views of the city and the river. Come and visit Baixa/Liberdade with us!